This blog is nearly 2 years old and I thought it was time to revisit the reason for its existence. I am still teaching 11 to 18 year-olds everyday in BYOD classrooms (not iPad only) and can claim a significant experience in the various pros and cons of all types and brands of devices. When I’m considering which students are supported the most in their learning by their device, I still conclude the iPad and its eco-system is my recommendation for handling the full breadth of activities and opportunities undertaken in 21st century schools. I do appreciate that during the last 4 and a half years it has become fashionable in education to proclaim “the device doesn’t matter” but each week I experience a at least one moment where it does. Who said you can’t teach both programming and digital citizenship with drum machines? I do. Be it a sliding control, a drum pad or an paint effect, the learning opportunities that touch offers far outweigh any outdated argument that young people can’t comfortably type vast amounts of text by tapping the screen. After all, they tap 30,000 words per year into Facebook alone, mostly on the phone! Touch offers a much more connected, real & enjoyable experience during activities. It often removes from the mind the fact that tech is even involved in the process. 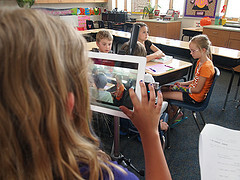 The iPads ability to physically replicate so many tools in the hand, such as a spirit level, microphone, test tube, moving paint, bouncing ball and any number of physics experiments, never mind the wow factor of green screening on the move also means the laptop student is left to imagine and not experiencewhat physical effect one thing might have on another. The average teacher and student needs as much support as can be made available when introducing or keeping up-to-date with using their devices to learn. Apple has always led the way with providing this support for education, highlighted by their organised, categorised educational app store. iTunesU has also become a major educational system for many schools and allows for the easy management of content whilst developing student driven programmes. iPads have the advantage of being the primary educational choice and in-turn have the educational app developers investing more time and money into serving schools on iOS. You may already know me as a supporter for kids learning to code. There is an international push to have all students learning this craft that forms such a central part of everyone’s lives these days. You can code on both Android and Windows 8 but only in it’s full advanced code form. If elementary / primary school kids want to learn how computers think and how code works, the iPad is still the only tablet offering apps, such as Hopscotch to learn how code works and has many on offer. Teachers supporting teachers support Students supporting students. Not my favourite topic, but for elementary / primary schools, non-BYOD and any school wanting more control over devices, apps and multi-seat licensing, Apple has now produced a suite of management tools that make this easy. I wont go into too much detail but check out the MDM and iOS8 pages for more info. The competition is far behind in this area, especially in offering educational multi-seat licensing for those apps you want every student to have. Extra thought – Google Account is a must. I thought I’d just add that in addition to the iPad, I do still recommend a Google account. The cloud-based document sharing eco-system that Google provide, along with Youtube makes it a must for handling the bulk of traditional documentation, whilst adding the sharing and collaboration tools. The Youtube is also a must of offloading the iPad video content. It’s just a shame that Google went with the business model when designing their Chromebook device, meaning people would require a 2nd camera device to carryout truly active 21st Century education. I write this from years of personal experience and yes, I know that there will be thousands out there who know one of the other systems inside out and will argue that it’s just as easy and flexible on the other platforms. My experiences tell me that the key difference is the amount of technical information required to setup quickly to learn on the other platforms. This takes time that many teachers & students are not willing to invest. One issue I’ve noticed is that where elementary / primary schools are more likely to be flexible, innovative learning environments, as students enter high school, teachers, concerned with what seems like a long list of content to get through, are more likely to be demanding lengthy written work after hours of lectures. This drives them away from considering the iPad as the appropriate device. I would ask those teachers to take a real look at how the world and especially the young people in their classroom go about their lives. Look at how collaborative, active & flexible we all are these days and consider how your content could be accessed and processed rather than delivered and simple duplicated by the students. For me, the iPad is still the device to get. It’s not just about business tools and apps, it’s about learning and this is still the are where Apple leads in tech. Education needs it easy and the iPad just works!